Saturn is a slow moving planet .Passing over one sign, Saturn takes two years and six months’ time. Saturn takes 30 years to make one round of the zodiac. When Saturn transits through the 12th house in a horoscope from the natal Moon, the period of Sade sati (7 years and 6 months) starts .Sade Sati is the sum of transit periods in three consecutive signs(2.5 years+2.5 years+2.5 years). Popularly known as Rising +peak+setting sade sati. The most effective is the time when Saturn is transiting over natal Moon(Peak). The first phase of Sade sati (rising or Chadhati) is related to close relatives. The second phase related to domestic front and also business front. The third Phase related to children, family, health and physical suffering. Saturn is the causing factors of (karaka) hard work, discipline, Old age and Authority. 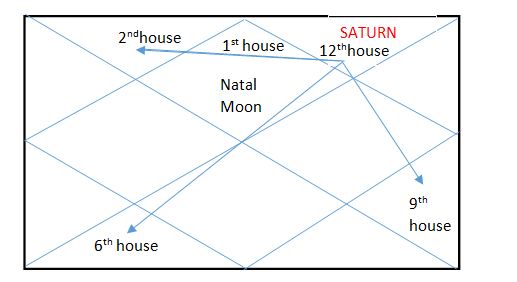 The first Phase of Sade sati start when Saturn transit over the 12 th place from Natal Moon. Saturn continue transit over this place for 2years and 6 months. If the moon sign of a native is Aries, then, when Saturn transit over Pieces sign, the first phase of sade sati will start for the native. It will continue for 7 years and 6 months till Saturn complete its transition over Taurus (Pieces+ Aries +Taurus). When Saturn transit over the first place or ascendant of the horoscope in Moon Ascendant (Chandra Lagna Kundali), the sade sati known as Janma Shani or the second phase of Sadhe sati. It continue for 2 years and 6 months. When Saturn transit over the second place, the third phase of Sade sati will start .It continue for 2 years 6 months. Saturn is the friend of Venus, Mercury. Sun, Moon and Mars are the enemies of Saturn. Saturn is neutral with Jupiter. The Paya of Saturn is most important to consider the effect of sade sati whether negative or positive. Silver and Copper paya is considered as good, whereas Gold and Iron Paya is not considered to be good. Following are the result of Saturn when transit (sade sati) over different moon sign (rashi) in general .But the lordship of Saturn in Horoscope and the Sad bala of Saturn must also be taken into consideration. So, according to the relation with other planets, Saturn give result. 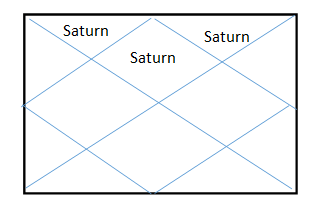 Following is the chart (table) about when Saturn transit over which rashi and the sade sati begin on which rashi occupied person. Suppose a native has occupied Mesh/Aries rashi, so when Saturn transit over Meen or pieces rashi , Sade sati will begin for that native. Second phase will start when Saturn transit over Mesh or Aries rashi and the third phase will start when Saturn transit over the Brisabh /Taurus rashi. Saturn has three aspects (3rd, 7th and 10th from its placement). So the effect of Sade Sati will be on 12th (transit), 2nd, 6th and 9th houses. Saturn is a planet of Separation. So, where it is placed in the horoscope, during Sade sati, it will separate the native from that matter. For example–If Saturn is placed in second place, it will separate or keep away the native from family. The aspect of Saturn is malefic(poison). So, the seventh aspect(180 degree) is very harmful to the native .The special aspect of Saturn is Third aspect and tenth aspect .In retrograde condition Saturn affect the ninth or tenth place from where it has placed in Birth chart. When Saturn transit over the twelfth house, Saturn affect the 12th house matter .So the expenditure of the native will increase due to investment which will turn fruitless later, on hospitalization or on foreign tour. Twelfth place reveal —spouse‘s health, ancestral property, grandmother, monetary loss, demotion, left eye or ear, sorrow, fine, long treatment, Confinement and Restlessness. The separation tendency of Saturn make the native to stay away from family or decrease companion of spouse .So all these matter get affected during the first phase of Sade sati. The 3rd aspect of Saturn fall on second house, the native may affected financially .The possibility of spending (saved) money happen by sudden incident .Food habit may change or the native may compel to have irregular meal. Digestive system may get affected .The speech of native may be very harsh. The native’s conversation may be misunderstood. Dispute may occur in family .General happiness will be disturbed. As, Saturn is aspect 6th (7th aspect) house from 12th house (180 degree angle), the native’s health will be most affected during sade sati. The native may be in debt due to health reason and treatment. Internal enemies may harass. The native may be affected by conspirator. Intestine and waist need special care. As, Saturn aspect 9th house from 12th house (10th aspect), the native’s luck will not support him/her in this time period .The relation with father may turn stern .If the native is pursuing any higher education ,the time is not favorable .The native may have a disliking for tradition or religion. Try to keep regularity in life. Punctuality will help a lot. Chant shani Mantra”Om sham shanaischaraay namah”. Recite Hanuman Kawach daily in the evening. When Saturn transit on natal moon/Chandra rashi, the second phase of Sade sati starts. Being a separator by nature Saturn will keep the native away from himself/herself, from siblings and from socialization. The native may be absent minded in these time period. Health of the native may need more care. In Aries, Saturn is debilitated.so in a debilitated condition in enemy house, Saturn will not be able to do much harm to the native, so the second phase of sade sati for Aries will go both good and bad (normal). 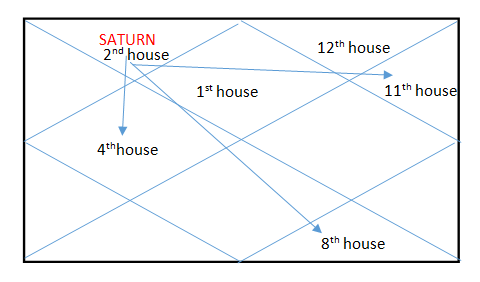 The 3rd aspect of Saturn will fall on 3rd house. As a result the courage and braveness will be affected. The confidence of the native will deteriorate. The relation with sibling may also stern. Progress may slow down. Any competitive examination during this time period need more efforts and may be negative. Servants of the house may create problem. Body parts especially, hand, neck and shoulder need care. The 7th aspect of Saturn fall on 7th house. 7th house of a horoscope is the place which cause death (marak sthan). So the health of the native and the health of spouse must be taken care of. Progress or improvement in life delayed. The relation with partner in business will hamper. Take care of Kidney and ovaries. Married life will get disturbance. The native may stay Away from spouse. 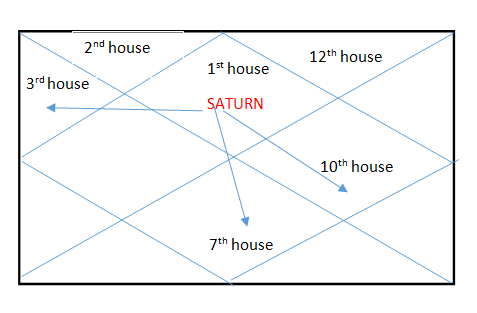 The 10th aspect of Saturn will fall on 10th house. The work place environment ,public life and establishment will be in problem. The native may lose interest in work. The standing in community may need more efforts. Chant the mantra of Dakshin Kali, in the evening. When Saturn transit over the sign next to natal moon sign the 3th phase of sade sati starts. The native may not save much. Family life may get disturbed. Either the native compel to tell lie or converse very rudely. The 3rd aspect will affect 4th house. Fourth house is the house of immovable property. Relation with mother may not be very good. If mother in old age or suffering any serious health problem, the native may lose his/her mother. Public relation may not be very interactive in this time period and popularity may decrease. Digestive system may need special care. If the native is a student or pursuing higher education, then he/she may not get the desired result. So, academic career need special attention. Home environment (family discord), Material happiness may be less. The health of Father- in- law may be a matter of concern or the relation with Father- in- law may be stern. The 7th aspect of Saturn will affect 8th house. The native may be affected by mental tension due to paternal property dispute. The native’s resistance capacity may be decrease. The native should take care of muscular system, bladder and private parts of body. Quarrel, difficulties, frustration and infamy make the native very miserable. The 10th aspect of Saturn will affect 11th house, so the income and source of income will be affected. Relation with elder sibling may not be good. The support from friends and elder siblings may be withdrawn. Any dispute with a permanent friend may make the native sad. Left ear need care. Control over speech is needed. Wise talk is advisable (Think before speak). Chant Shani mantra, “om sham shanaischaraay namah”. Daily recite Hanuman Chalisha in the evening, once. Visit Shani temple in Saturdays in this period of time. Sade sati is the time when a person will face the reactions of his/her previous deeds. Your Sade Sati has been started when Saturn has come to Dhanu rashi(Sagittarius). Please go through the article on Sade Sati of this website for details information. I look at the moon rashi and sometimes it comes out as Tula (Libra) and sometimes it comes out as VRISHCHIK (Scorpio) – which is correct? Iam in which phase of sadesati – 1st or 2nd phase. which phase is very problematic? I am undergoing Sade sati, nothing going as per plan and tention in day to day activities are mounting. You are going through your sadesati. any of your plan will never happen positively. Kindly follow the process mentioned in the website and deposit INR 1100 in the bank account for answering your queries. Could you please let me know about career status. I have been having very bad experiences since a long time now. you are under the influence of Shani Sade Sati,second phase. I am Shyam Narayan Rai, Date of Birth – 02nd September 1984, Time : 01:55 AM; Career related query ; facing a tough time since 4 Years, not finding a way out. Expenses have been increased twice the salary resulting in debts. Looking forward a way to reinstate my focus in life. Looking for ward to start my own business but nothing is getting materialized. Request to show me some way out. Please share your birth details ,date,time and place of birth. I am Sagar, born on 11th May 1985, at 18:20, in Sira Karnataka. Currently I am under Sade saathi, but I feel like reenergized and confident look. Is “Shani” favourable to me? Saturn is a favorable planet for you. So ,the period of sade sati will be good for you. this time period will not be very good financially. From 18 March 2018 to 10 October 2019,you will be under the influence of Moon Mahadasha with Saturn antardasha .So ,Saturn will be more effective .So take all remedial measures to get relief .Saturn will effect your home front Delete repeated word and financial gain. currently i’m in sade sati. You are under Shani sade sati,second phase.This time period will go a mixture of bad and good. But from 29 nov 2017 to 30 june 2019 ,you should be vary careful regarding your health ,personality and married life. as you said it effected badly on my relationship. i’m just curious what exaclty you mean by personality ?? is it my career or financially ?? if not how it is going to be effected ?? thank you for u r guidance. Hi, I am going under sade sati. Nothing is well at home and family tensions are increasing day by day. Problems in career. You are under the influence of second phase of Shani sade sati. Home environment,family disturbans and probles in wrokfiled will occure. My date of birth is 10th April 1974. Time of birth is 1600 hrs and place of Birth is Delhi Cantt. Can you please tell me which phase of sade satti I am? you are under the influence of third phase of Shani sade sati. I am Shilpa. Date of birth 15th Jan 1983 6.10 am in bangalore. Currently i am going through Sade sati. Consulted an astrologer he says i will have financial loss till 2020. And i will have very bad time from 2020 to 2023. Am unmarried. Now really scared of loosing career and marriage yoga both. You are under the influence of first phase of Shani sade sati. of your health ,you may not save money during this time period. will my dream come true in this phase? It seems difficult but possible that your dreams come true. Can you please let me know in which phase of the sade sathi I am going through? In very bad phase of life, especially, regarding career. Is required to give your answer. I am going through Sadesati and facing lot of problems. My DOB 14/02/1985 . When will I come out of it. To know about Sade Sati. You are under Sade Sati. After December 2017,you may get relief from Saturn. Still take care till July 2019. My son is having difficulty with engineering exam. Which paya of Shani is he facing ? He does not believe in prayers. Pl suggest remedy . Your son is under the influence of Sade Sati. He is also under the influence of Saturn antardasha till august 2020. Hence Saturn will influence upon him with double intensity.Hence you must do the remedy by chanting Shani beej mantra daily for 108 times on his behalf. I’m under the last phase of Sade Sati. Considering the placement of Shani in my natal chart, can you please advise if this phase is beneficial for me. Please go through our article Shani Sade Sati in this website. Many thanks for the email link. My name is Prakash Jain, my DOB is 11.10.1983, time: 6.45 am, place: Kolkata. My question is I am in which phase of Sade Saati, is it beneficial and/or what should I do to get benefit from it and if any stone needed to be worn. You are now under the third phase of Shani Sade Sati. Financially,you should take care of. No need to wear any gemstone. My name is Venkatachalapathy , my DOB is 28.09.1968, time: 4.55 am, place: Palasa, Srikakulam dist, Andhra Pradesh. I am in which phase of Sade Saati, is it beneficial and/or what should I do ? I am planning to start up a new venture is it the right time?? Regarding work ,you can go for new venture. For detail career guidance you can consult by following the procedure. What should I do ? Some one suggest some blue gems. Could you please clear that to me if this phase bringing some bad luck or how this effect my present life. You need not to wear blue gem stone. wait till 5th of February,2018. I am facing lot of problems in job life. To be exact I am not able to doing smooth in my job life. When the situation would improve. I am currently under sadesati phase 2. There are a lot of delays and obstacles I am currently facing in my personal and professional life . What remedies should I do? Secondly, getting married during sade sati should be considered ? daily.Also do offer water to Sun God within 2 hours of sunrise. Many thanks for your kind reply. Is it suggested to get married during sade sati phase? Can you advise about growth possibilities on the career front for 2018 -20? Your setting sade sati will be normal. Iam not feeling well and am having health anxiety please help. Chant “OM” daily for 5 minutes. If feeling more anxiety, consult Doctor. Please Please tell me why my hard work not materialize……. Please reply soon and suggest some remedy…..
chant “OM” daily for 6 minutes. you will get better result. Astrologically, Your Moon is debiliated . I am not getting job . Being told that i am in sade sati . is is bad for me? Or is this phase good for me?? You may get job after November 2018. My D.O.B is 1 jan 1980, time 6 AM and place is delhi,i am un married. I am going through last phase of sade sati. i am facing lot of health issues and financial problem. My job is also lost. I am away from my family. When will i get any job and everything will be fine. I have started offering water to peepal tree everyday and going to hanuman temple every tuesday. Please help. You are not under sade sati. Youa are under the influence of Shani Mahadasha and also Shani Antardasha. You are under the influence of Dhaiya of sade sati. All will be fine after 2020.
chant Shani mantra 1001 times. So chant Shani Mantra for 1001 timeds daily. By chanting shani mantra ,will I get little relief from problems?I have promised a girl to meet her for marriage, but not able to go to meet her. With this will I be able to meet her for marriage?. My name is Neetu Gupta, D.O.B 15 jan 1980, 10.00 AM, place jodhpur. I am going through last phase of saade saati. I am facing lot of problems in marriage. I want to marry a person whom I like. But it is not happening. Every time one or other problem comes up and i again had to wait. Please tell me will i get married to a person I like?When will my marriage will happen? I am also facing lot of problems in job. Please help. Plz tell when will sade sati end for me. And suggest some remedies to reduce its effect. Chant”om shang shanaischaraay namah” daily 3malas. Contact thru email for your daughter is going through Rahu Mahadasha.So need to be careful for study. It needs very detail study of her horoscope,hence can’t do prediction free. In your husband kundali Shani is with Rahu,hence worship Hanuman ji daily for 4 years. The third phase of Shani Sade Sati is going on.Chant Om sham shanaischaraay namah daily . I have head that my saashe saati second phase is going on and i am experiencing difficulties in life. My father and monther hospitalized some time back . I have gone through unexpected sudden throat surgery. my wife is diagnosed with thyroid and low blood presser recently. My daughter is not keeping well. It seems it is all being just because of me or my saadhe saati period. Kindly advice some solution to this. also please share your contact number if possible and i would like to meet you for this. the ruler of 3 & 4 houses,it seems your mother will be affected.It also effects you , your spouse and your father.It also effect your child.In total this phase of Sade Sati effects very badly on your FAMILY.Finance is also affected. Besides Sade Sati ,kal sarp Dosh is also there in your birth chart. You need to rectify as soon as possible. I am going through difficult ever phase for last 4 years. To brief…. 1. My wife had gallbladder surgery on march ,14. 2. My mother fell ill and got hospitalized… Had un believable fight lasting almost one month in I.C.U and 6 days in ventilation finally came back but lost her will and strength… Feb 15. 5. Even after heavy restriction my mother fallen seriously ill due to very minor foot injury occured in train and having diabetic foot gangrene. Her condition is pretty serious now. 3. My marriage is also having lots and lots of disturbances and is an unhappy one. You are going through sade sati. Chant “om sham shanaischaraay namah”daily. Very soon you will be in a better condition. You need to make payment. ok sure. please share details to do the needful. Please tell me when my good times will start. Life has become miserable. Your good time will start from November 2018. I am going through a very tough phase. Can’t find happiness in anything. I am sad and angry all the time. I am having a tough time with my husband and son. Job wise I can’t seem to find a permanent job. I know I am in the peak phase of sade sati. Will things get better? Esp, my relationship with my husband and son and finding a permanent job? September 2018.Recite Chandrashekhara stotra daily,once. Presently in sadesati. How it will be . Sade Sati will be good for you. Can u please tell me Abt my job aspect.My health is getting affecting .Not keeping Happy .Feeling angry and disappointed. Hello, my date of birth is 23.04.1970 18:30. Tuzla, Bosnia. According to my calculation my Sade Sati started in November 2011. It is the worst time of my life. Will it ever end? Thank you. You will get relief after December,2018. Shani Sade Sati ,last phase. Worship hanumanji to get relief. Do Continue your puja to get relief from Sade sati. I am in last phase of sade sati, can you please tell me what to expect and any rituals that I have to perform? under Astro gyan Section .REMEDY is mentioned . My DOB is 03-04-1997 , time 12:55 Pm,Birthplace:Kollam,Kerala.Want to know about my sadesati now and is this beneficial for me. You are under shani sade sati. It is beneficial for you. My dob is 7th sepetmber 1989..time of birth is 16.30 and place is ghy…cannyou tell in which phase of sadde sati i am…n hows affecting my education. You are under the influence of third phase of Sade sati.It will not affect your education adversely,but may delay the result . My Date of birth is September 22,1977. I was born on 9:00 am. I know I am under sade sati. I lost my mother as soon as sade sati started.Any remedies will be greatly appreciated. My place of birth is Lushnje, Albania. Sade sati continue for seven years and six months. As a remedy help poor people,feed them and do not tell lie. I think i am undergoing my safe sati period started March 2014. I have to move places to places, my marriage is broken, I could not find a good job to maintain my life, relationship with my mother is also worse. Iam under stress and depression ever since my safe sati started. I have been doing meditation, puja, helping poor people. Could please tell me when it is going to end? And will I find a good job to support my life and my studies. Will I find some good one? Your advices are highly appreciated. It will come to end on 22 March 2020.
better job ,do Surya Upasana Daily. Thank you for your advices. Things are happening beyond my control but your message have made me feel more relief. May I ask if my marriage can be saved or there will be someone come into my life? Can I ask how to perform the Surya Upasana? I was doing very well in my job till last week. Then the management gave me 2 weeks notice. Everyone I work with were surprised, and I am in shock. I believe I have shani dash going on. I am very anxcious to know when I will get a new job. My DOB: 16.10.1974, 10.15 am. Born in India. Am i going theu sade sati? What are the remedies? Kindly tell me. Thank you very much. Hi, I was born in Jabalpur, MP, India. Dhanyavaad. Am I in sade sati and when will it end? Born: November 18th, 1993, 5:14pm in Toronto, Canada. You are under Shani sadhe sati. It will end on january 2023. Hi, my dob is 6 August 1979, 7:35 am, born at Andhra Pradesh. I am jobloss. Have been doing meditation and pooja. No relief yet. I want to find a job soon. Please advise. Thank You. Meditation help you to develop patience in time of distress. There are various types of puja done to achieve something.